I have now collected and sorted all the various donations and we have reached an incredible total for the BIG BAD BIKE RIDE 2016. A new record! We have had some fantastic donations from so many individuals and teams. I would like to say a special thank you to all my Big Bad Bike Ride and Ball Committee members, but most of all thank you to all the riders and sponsors who have donated to make this charity fundraising something special. Ataxia UK has decided that they will create a special Kennedy Family Annual Award to be aimed at inspiring young researchers to be motivated into finding a cure for Ataxia. This is something I intend to support and reflects the original motivation for creating the Big Bad Bike Ride. In case you missed them, there are three videos to watch. I am not yet sure what the future holds for the Big Bad Bike Ride and there will not be a ride next year, but for the moment can I say a huge thank you to everyone involved. How Graham was given his mission. A York businessman who was inspired by his children to embark on two decades of charity fundraising tells his story to Stephen Lewis. In 2012 Graham Kennedy received an MBE in the New Year's Honours. 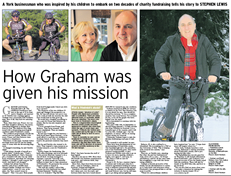 After putting the letter from Her Majesty's Service to one side for nearly a week, suspecting it to be a large tax bill, Graham eventually opened it to discover that he was receiving the award in recognition of his charity fund-raising work. Graham says the award is "a tribute to all the people who have helped me. 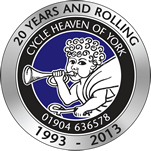 Over the years, a lot of people, mainly from the York area, have been involved in the bike rides."